When supporters and members of political parties say, ‘we in power’ or ‘we lost power’ we have to be reminded that they are emotionally tied to these political parties. They share a communal sense of well-being. As with all political parties, the supporters also live vicariously through their party’s oligarchy. Most grassroots supporters in Trinidad and Tobago are comforted with a sense of inclusion through seeing their racial kind in leadership. Many Africans remember the “Is We Turn Now” language and conduct from many Indians when the Panday-led UNC was in government during the period 1995 to 2001. Having seen political power for the first time many Indians in their exuberance were openly spewing their racial dislike for Africans. One must also remember that Basdeo Panday solidified himself as the political leader of Indians by appealing to them on a racial level at every turn. He convinced many Indians that they were under a constant racial assault from the PNM. So in many respects, Africans do have reason to be distrustful of Indians in leadership. This People’s Partnership government is somewhat different, besides the obvious fact that it is led by an Indian woman who has broad appeal across racial lines. At this point in time, this government does not have the appearance of being an extremely elitist, Indian-controlled coalition. The UNC and the People’s Partnership coalition both have a better image today and this is largely due to the presence of one man: Jack Warner. He is the only African in a leadership position in the alliance, who, by virtue of being relatively financially independent and powerful in his own right, will not be seen as a stooge of the Indian elite or anyone else. Without Warner, all the other Africans in the coalition could be considered subordinates to Indian elites. If Warner is ever forced out of that party or demoted in government then the People’s Partnership would be led by several elitist-type Indians who were staunch defenders of Basdeo Panday’s failed leadership. They did not take a stand with Warner in calling for UNC’s internal party elections which eventually ended Panday’s political control and which made the UNC attractive to the wider populace for a chance in government. It is in this light that Kamla Persad-Bissessar, who herself did not take an early stand to remove Panday, must unequivocally defend Jack Warner except if he flagrantly breaks the law. Many Africans, who are supportive of this partnership, for now, are cautiously keeping an eye on how they deal with Jack Warner and how they control Indian racism. Of course, because of how Jack Warner invested in Chaguanas and other parts of Trinidad, many poor Indians and Africans are grateful to him and defend him as their representative. This is a welcoming sign because poor Indians are usually the force behind the Indian elites, and with their support behind Jack Warner, he cannot be easily discarded. Having said this, I am personally not too bothered by some of the racist comments that I hear from some Indians. I am sure that there are racist Indians in the People’s Partnership government. But many Indians, including the ones who spew racial venom, are quite aware that this People’s Partnership victory was dependent on several African factors – Jack Warner’s leadership and finance, and the increased support from Africans on the ground. For this government to survive they will need the ongoing support of Africans in and out of government. I have also long heard many Africans utter racist comments about Indians. Christian-Africans through the PNM have dominated political power in this country for a long time and have even marginalized other Africans who promote African awareness. Many Christian-Africans consider any indigenous form of worship to be evil, so their prejudice is not only towards Indians but even other Africans who engage traditional African religious practices. They, like ex-PM Manning, consider the wearing of traditional African clothes on a regular basis to be backward (they make a costumed allowance for the Emancipation celebrations). This Christianized-African PNM dominance has also contributed to Indians holding firm to what they perceived as their only political vehicle, the UNC and its earlier manifestations. It is no surprise that even when Indians were disappointed in Basdeo Panday, they did not throw their support behind the PNM. PNM represented a dominant African-based political force over them. African PNM supporters should not be in the position they are today of feeling threatened by racist Indians. PNM has been in political power the longest and if they were unable to make their support base feel better about themselves and to be in a position to challenge and defeat any racist group in Trinidad and Tobago, it is their fault. If the PNM government did not allow the education system to comprehensively address racism, then guess who is to blame? It is foolhardy for PNM members to feel that maintaining PNM in power at any cost is about resistance to Indian racism. Their complacency in the PNM is why the party always played down the concerns of African activists who sought to engender African consciousness. PNM’s inability to consider African-centred folks to be worthy of promotion in the political landscape is partly responsible for their party members’ low self-image. There is a history of PNM disrespecting and disregarding African activists even while facilitating Indian culture in the state media in an attempt to woo Indian voters. This foolish policy that denied Africans and allowed Indians to use the state media, inadvertently allowed Indian activists to use the same state media to consolidate their political forces against the dominant PNM. PNM members were never interested in what was being presented under the guise of Indian cultural programs. They smugly thought that PNM would be in power forever. While Indian activists stepped up their campaign of building political awareness and started challenging the status quo in the early 90’s, Christianized PNM supporters were caught unaware. They could not decipher which Indian concerns were legitimate and which were illegitimate. The presence of Dr. Cudjoe only helped a little except that Africans who gravitated to him were mostly interested in rivaling Sat Maharaj and other Indians. This is not sufficient to raise the consciousness of Africans so they could liberate themselves while preparing them to guard against both external and internal threats. Africans who feel threatened this time around can use this time to learn the many lessons that they have traditionally neglected – especially African history – to first raise their awareness to become more creative and more astute financially and politically. If they do this while aligning themselves with other progressive Africans they would never have to feel threatened by anyone. PNM members (most of whom are Christians) have to be a lot more honest and stop only looking at racism in the context of what some Indians spew and do, but also look at themselves and see how they are racist towards Indians too. They also have to examine their prejudices toward other Africans who adhere to African traditions. The article was well written and balanced. Ron, your scathing remark with regards to ‘Africans waiting on handouts’ is derogatory and divisive. I belong to a new group of young professionals who are qualified at a first degree level or above. This was earned from hard work, sacrifice and discipline. My daughter received SEA results and passed for one of the most prestigious schools in the country. I passed on the same attributes to her. STOP SPEWING VENOM. Across the many diasporas we will engage self-hatred and racism. We are to be like the author of this article and meet it head on, dissect and endeavour to make it better. PP is like any other party before it; it has feet of clay. It is not perfect; due to the fact that the people that make up the party suffer from the human condition just like you and me. 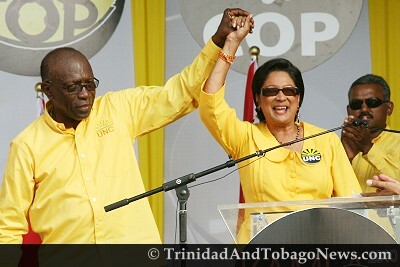 PNM and UNC had there problems – crime, corruption, arrogance of the leaders of both of the aforementioned partiies etc. By the way if you and others like you throw these kind of comments out there I have all right to be concernced but never afraid. Every challenge and problem can be removed, nixed or overcome because our future will not be one made of muck, mire, half truths and fear. We can do much better than that. By the way Ron, if you fell on Fredrick Street and I was behind you, i would pick up and if need be attend to you. I don’t CARE if your phenotype is in local palance indo, dougla, callaloo, blackchinee, african and our many other compositions.